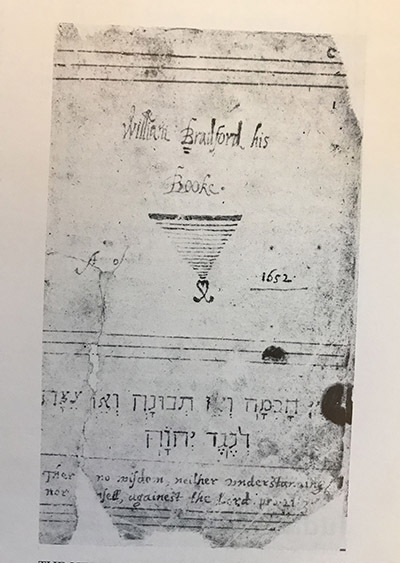 An Exercise Book of Governor William Bradford in Hebrew. No Jews resided in Massachusetts in 1652, the year of this notebook, but Hebrew, as the language “in which God and the angels spake,” was taught in the College. 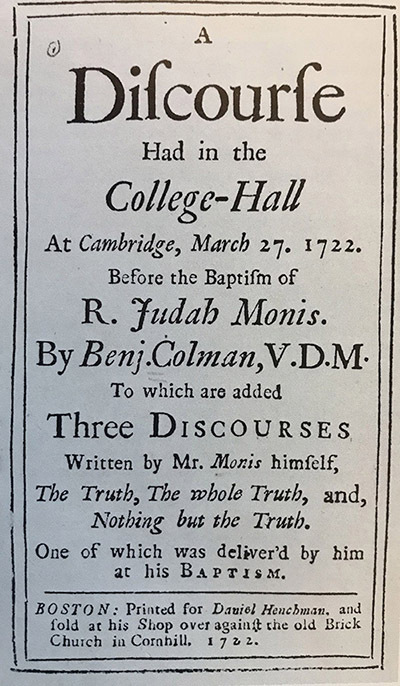 The first recorded Jewish person at Harvard was Judah Monis, who received a degree in the early 1720s, and around the same time was induced to convert to Christianity in a public ceremony in College Hall in order to join the faculty as Instructor of Hebrew. 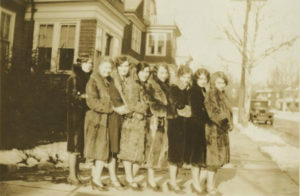 Radcliffe women of the 1920s. 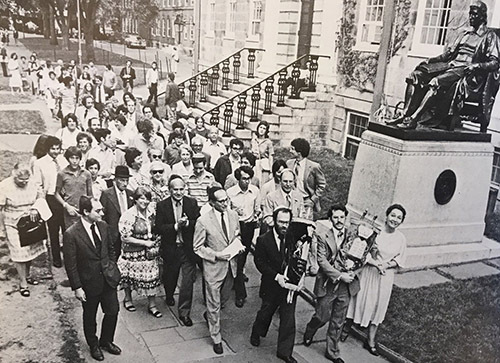 By the time Harvard celebrated its 250th, in 1886, perhaps a dozen Jews had graduated the College; forty years later, Jews exceeded 20 percent. 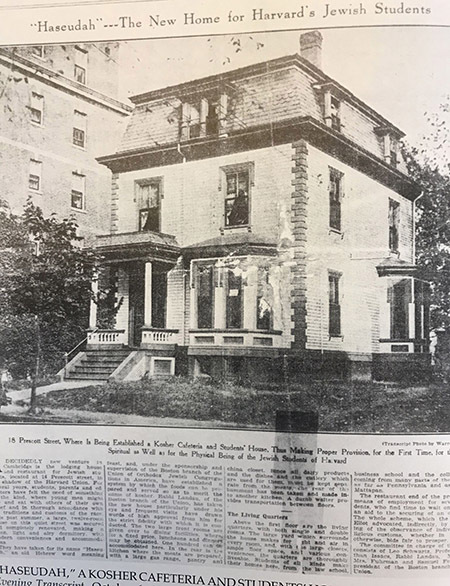 “Haseudah” (“The Meal”), a kosher dining club and residence for Jewish students, was established in this house on Prescott Street in 1926. 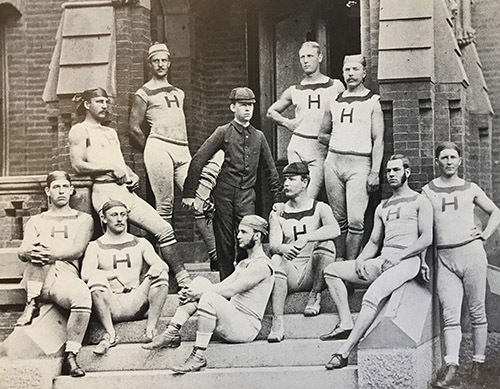 Lucius N. Littauer, for whom a Professorship in Jewish Studies and the home of Harvard’s Economics Department are now named, and who helped to found the School of Government, is shown second from left in this photograph of Harvard’s crew team from 1878. Littauer also coached the Crimson football team. 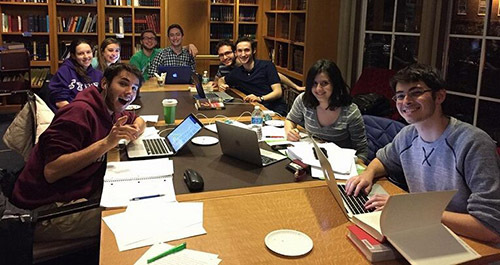 The Lucius N. Littauer Foundation continues to support Jewish student life through Harvard Hillel today. 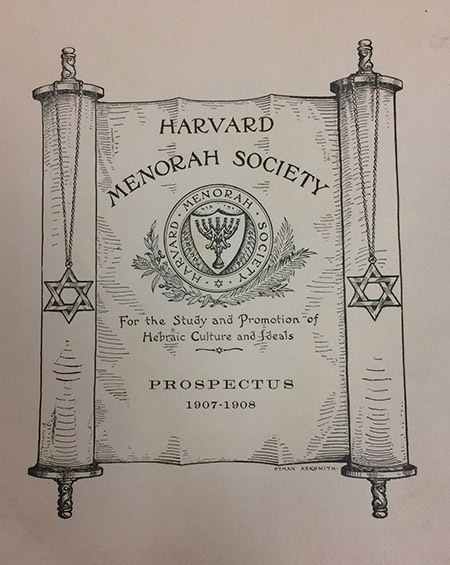 A 1907-08 Prospectus of Harvard’s Menorah Society, the precursor of Harvard Hillel. 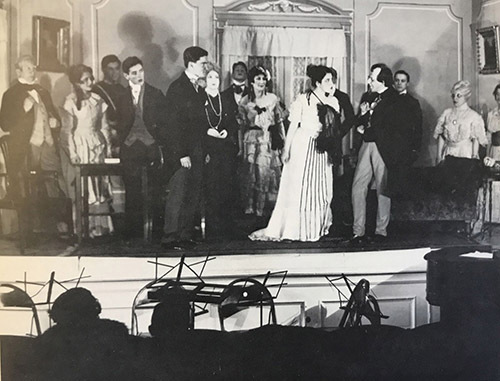 The Menorah Societies of Harvard and Radcliffe present the play “Disraeli” in 1929. 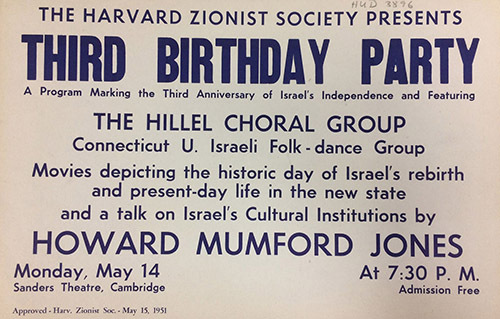 Israel’s third birthday celebrated in Sanders Theater by Harvard Hillel and guests. 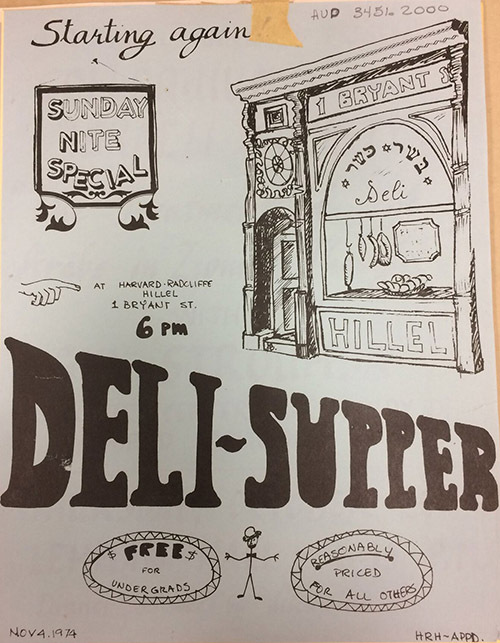 Good food is a perennial staple of student life, as attested by this 1974 Harvard Hillel poster. 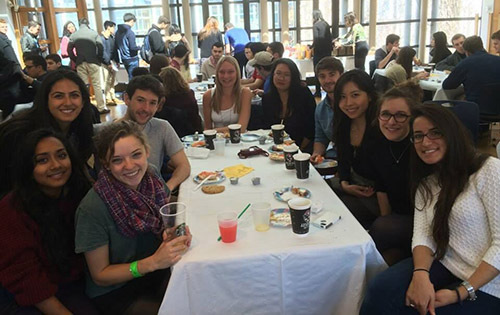 Rabbi Ben-Zion Gold and Ruth Master with students at a Harvard Hillel bagel brunch. 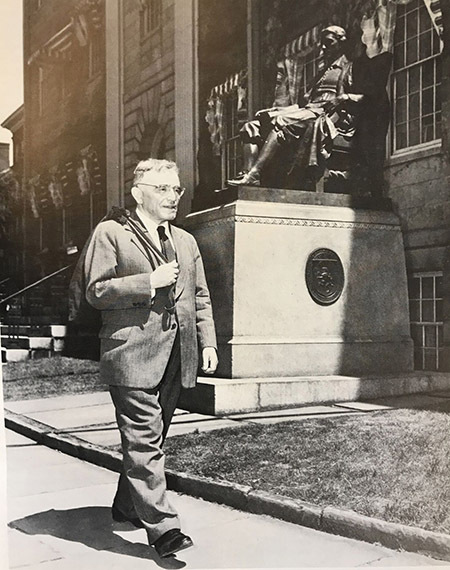 Professor Wolfson of Harvard, the first Chairman of a Judaic Studies Center in the United States, walks past the John Harvard statue in 1956. 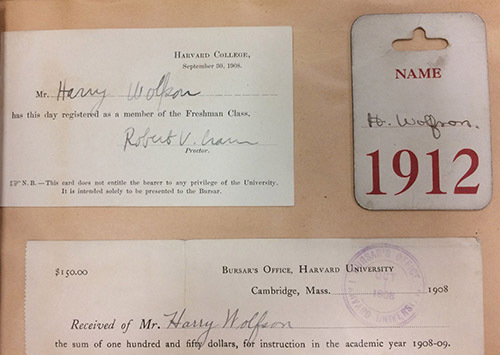 The records of Harry Austryn Wolfson’s freshman registration as a member of Harvard’s class of 1912. 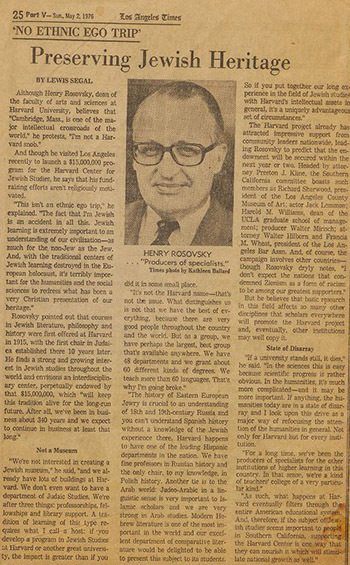 The Los Angeles Times reports on Henry Rosovsky’s fundraising tour for Jewish Studies at Harvard. 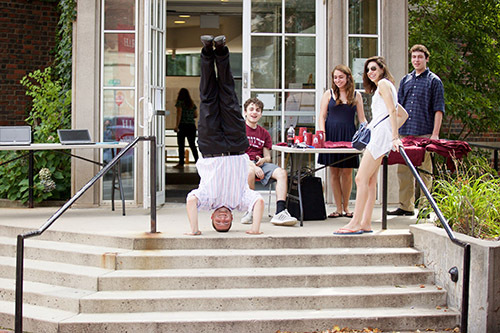 “Not an ethnic ego-trip,” Rosovsky insisted, and indeed, he helped to build Harvard’s general curriculum entire. “Burning the Mortgage” at Harvard Hillel on Bryant Street. 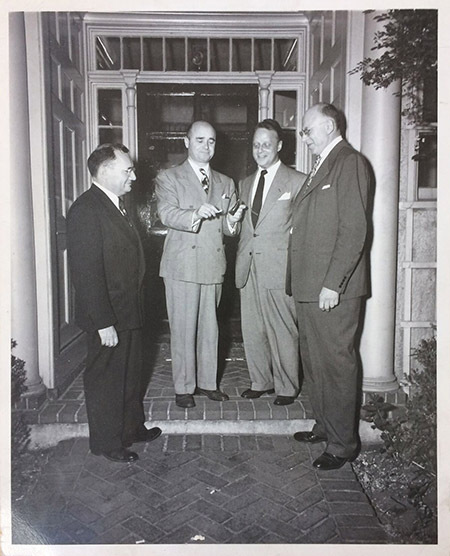 Pictured are Rabbi Maurice Zigmond, Herman Dana, Rabbi A. Lelyveld, and William Cantor. 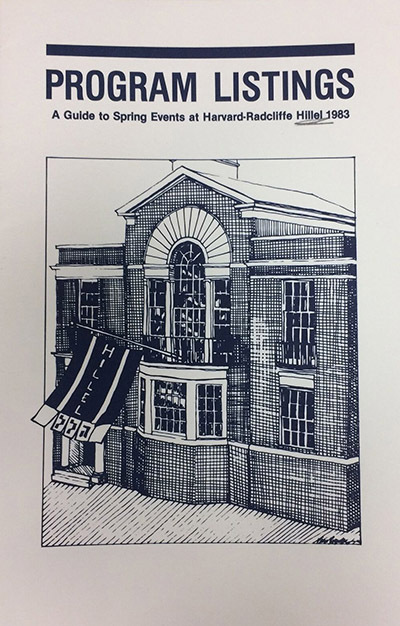 A program guide depicting Harvard Hillel at 74 Mount Auburn (once the Iroquois Club and now Harvard’s Office for the Arts). 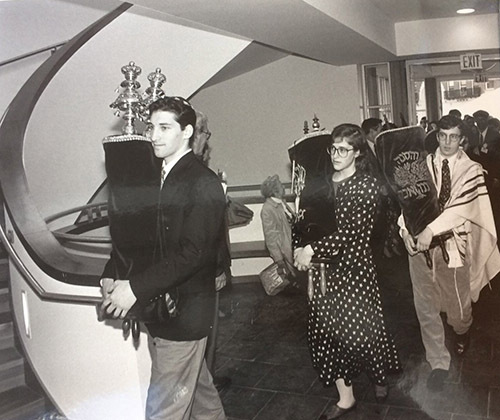 Students bring the Torah scrolls into the newly built Rosovsky Hall in 1994. 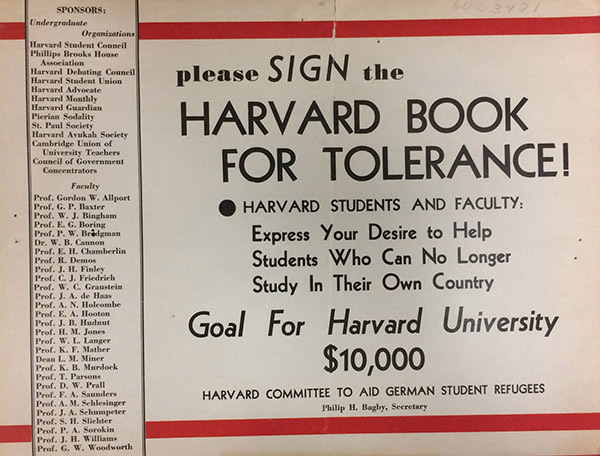 Harvard had an important role in bringing German Refugee Scholars to the United States in the period of the Nazi regime; support for German Refugee Scholars was widespread in the University community. 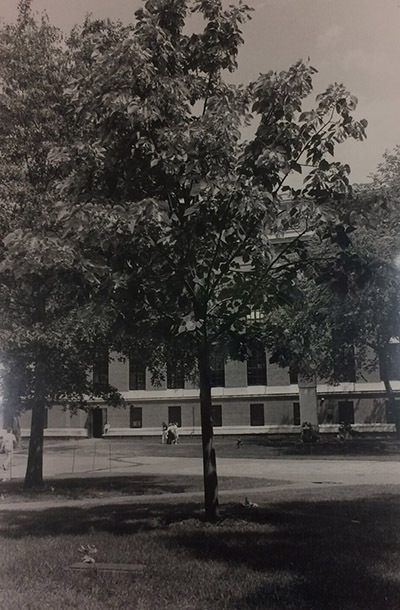 A tree planted by the German Refugee Scholars, which flourishes to this day in the Yard. 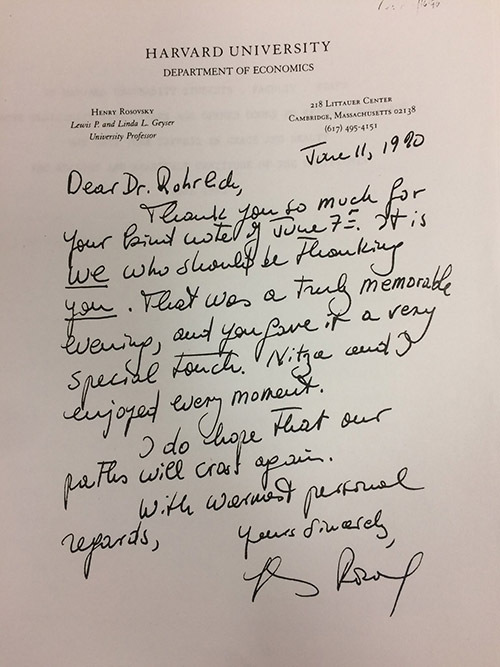 A letter from Henry Rosovsky to George Rohrlich, in appreciation of the reunion of German Refugee Scholars, at which the tree was planted. 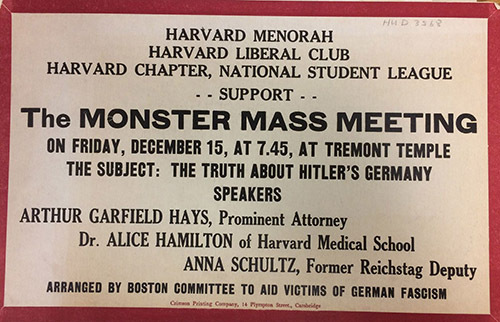 Harvard’s Jewish community played an important role in the University in raising consciousness with regard to the menace of the rise of Nazi rule in Germany, and in a push to bring German Refugee Scholars to Harvard. 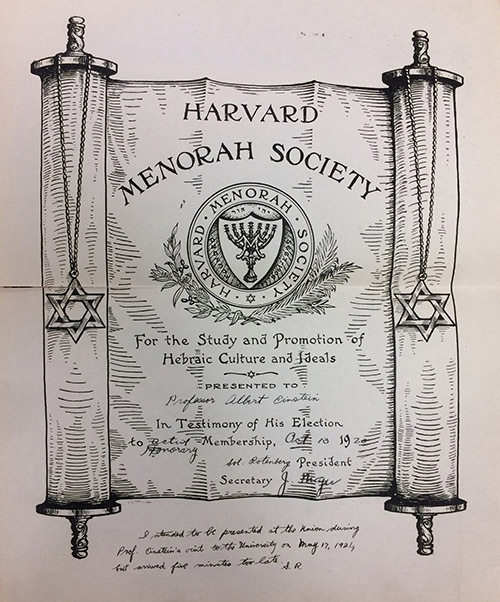 The Menorah Society prepared this certificate of honorary membership for Albert Einstein, but (according to the note penned on the document), it arrived five minutes too late to be presented to the Professor during his visit — a testament to the immutability of time and space under normal conditions, despite the best intentions. 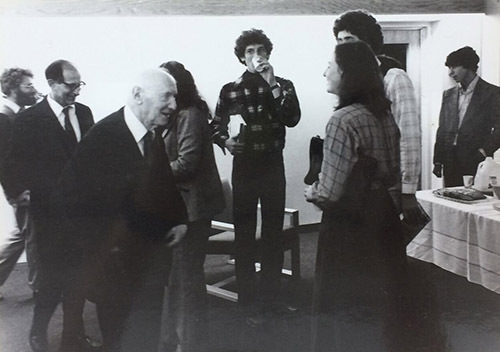 Isaac Barshevis Singer visits with students at Harvard Hillel. Students (and the child of a Tutor) celebrate Hanukkah in Cabot House with two of Harvard Hillel’s rabbis – one of many celebrations Harvard Hillel helps students host throughout the University. 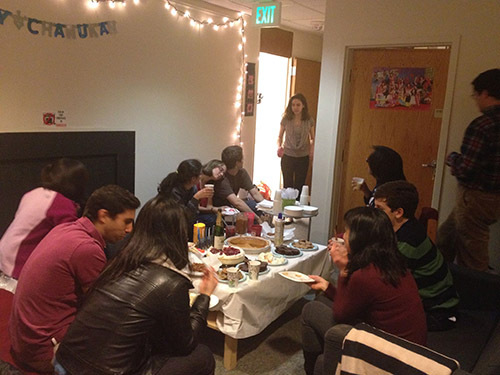 A Harvard Hillel-sponsored Hanukkah party in a student residence. 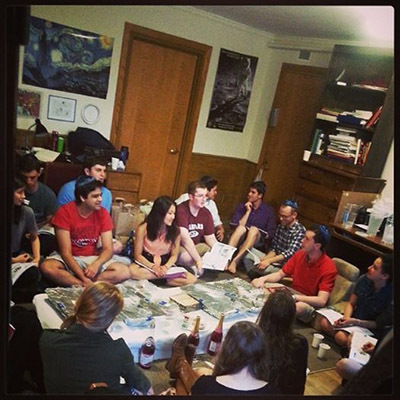 Students share a Passover seder in one of Harvard’s Houses – one of more than 30 student-hosted Harvard Hillel seders throughout the College, in addition to our huge communal seders in Rosovsky Hall. 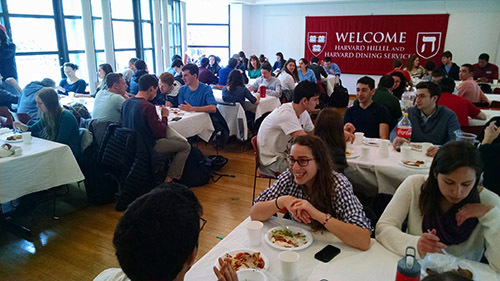 Today students share our Jewish heritage and community proudly through Harvard Hillel with their friends and peers of all backgrounds and nationalities. 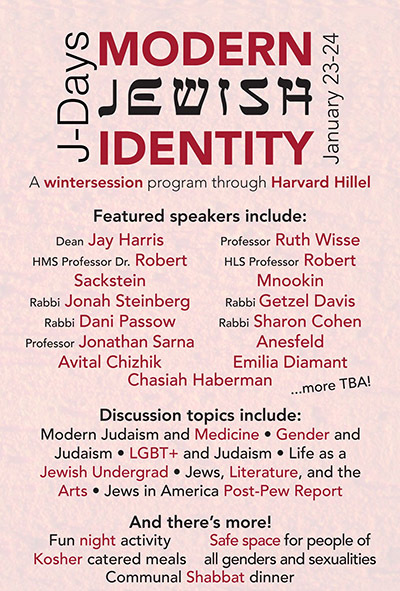 Harvard Hillel’s University-recognized J-Term program on Jewish identity. 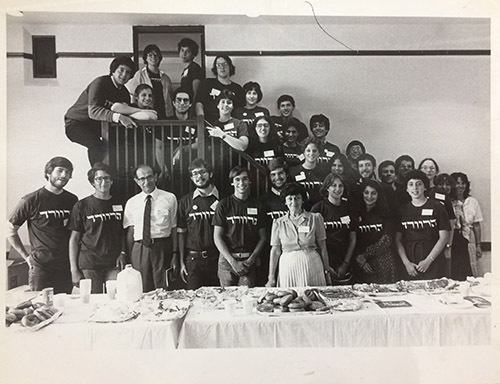 The program was conceived by students, a hallmark of co-curricular life at Harvard Hillel. 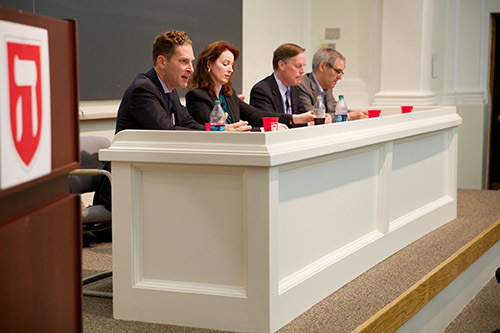 Harvard Professors Noah Feldman, Meghan O’Sullivan, Nick Burns, and Michael Ignatieff discuss a “Turbulent Summer” in Israel and Gaza in a Harvard Hillel forum program. 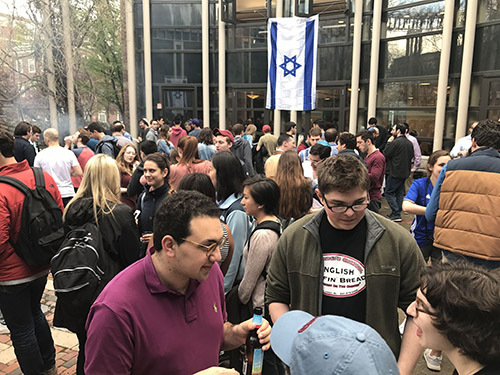 An Israel Independence Day barbecue in the Edmond J. Safra Courtyard at Rosovsky Hall. Harvard Hillel Undergraduate Steering Committee elections. 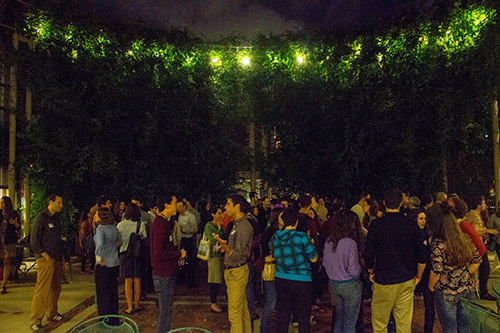 Jewish graduate students gather for a reception in the Edmond J. Safra Courtyard at Rosovsky Hall. Ambassador Dennis Ross and Israeli MK Tzipi Livni discuss lessons for dialogue in a program of Harvard Hillel and Harvard’s Program on Negotiation. The Rabbi Ben-Zion Gold Dining Hall at Rosovsky Hall during the week of Passover. 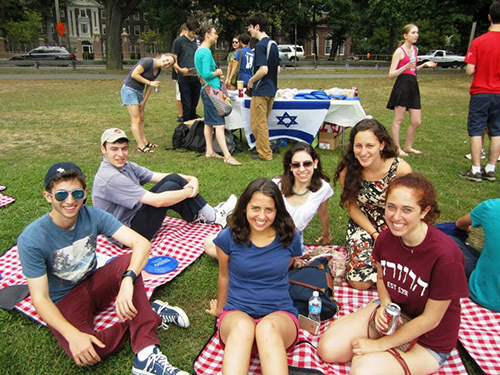 An Israel-themed Harvard Hillel picnic on the bank of the Charles River. Preparing to welcome the freshman class at Rosovsky Hall. Rosovsky Hall is a favorite spot for study and for Jewish learning. 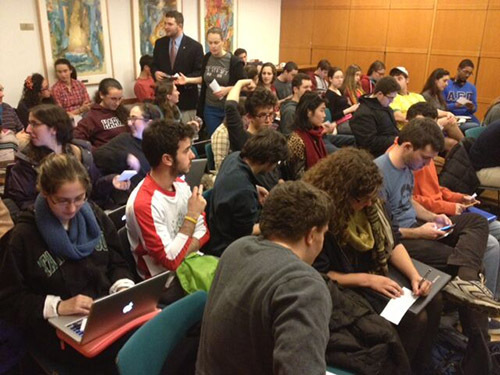 Students demonstrate that friends of many Jewish orientations are welcome in Rosovsky Hall. 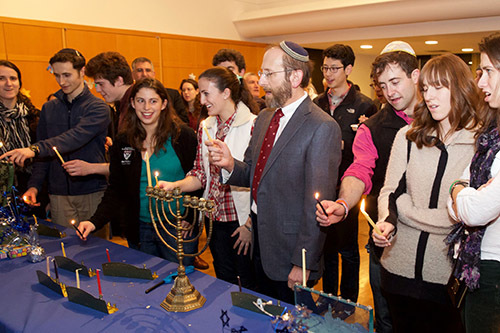 Provost Alan Garber lights Hanukkah candles with students at Rosovsky Hall. 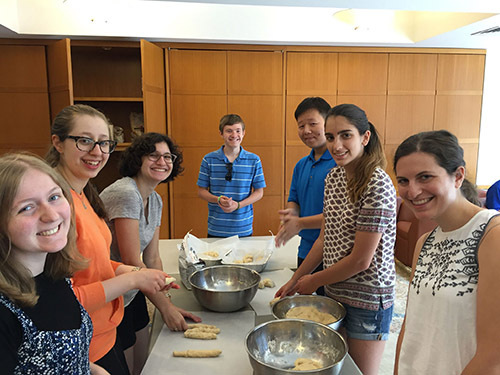 Baking “Challah for Hunger” at Harvard Hillel. The best challah-bread in the Boston area (by many accounts) is baked and sold by students at Harvard Hillel weekly, to raise funds for worthy causes. 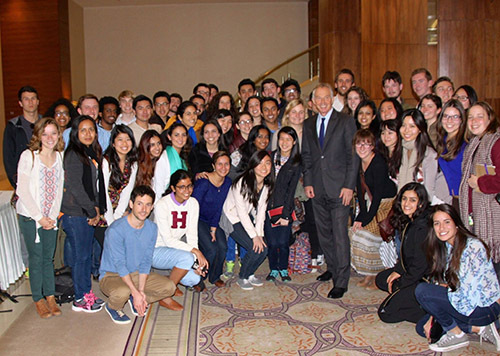 Students on the Harvard Israel Trek meet the Rt. Hon. Tony Blair in Jerusalem. 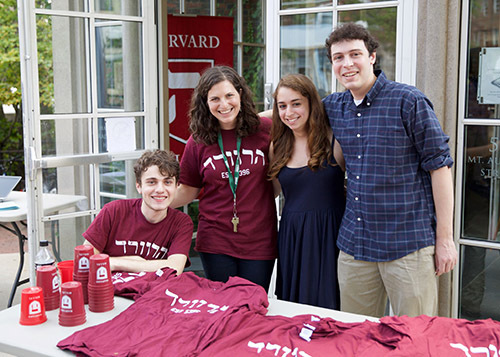 The Harvard College Israel Trek is planned at Harvard Hillel by Harvard undergraduates from Israel who share their country, our homeland, with peers of all faiths and backgrounds through a ten day spring break trip with a stellar itinerary.